Trump’s fans have joined the president’s victory lap over his summit with Kim Jong Un — including in a bizarre fashion show nod to the meeting. June was a busy month for President Donald Trump. He met with North Korean leader Kim Jong Un in Singapore, the first US president to do so, and he also turned 72. At one key moment, a woman in a flowing, black and white, Asian-style costume appeared. As martial-sounding music played, she walked the runway with arms outstretched, carrying what looked like a red velvet and gilded Valentine’s Day candy box. The women cheered as she paused, lifting the box to the heavens. [Organizer] Ms. [Alice] Butler-Short took the stage, her substantial, bejeweled gold lamé millinery bobbing. “That signified our great president and the negotiations he is having with North Korea,” she said. The music, she explained, was the North Korean national anthem. Trump’s supporters have followed suit. According to a poll released last week from Ipsos and the Daily Beast, self-identified Republicans view the North Korean authoritarian who uses public executions and forced labor to oppress his people and, until recently, was threatening to fire missiles at the US territory of Guam, with a higher favorability than House Minority Leader Nancy Pelosi. Kim’s favorability rating is 19 percent among Republicans. Pelosi’s is 17 percent. About half of all Americans approved of Trump’s summit, but only about a quarter believed it would be successful, according to a separate Reuters/Ipsos poll taken after the summit. Yet the same survey found that Republicans were two times more likely than Democrats to say Trump and Kim’s meeting diminished the threat of nuclear war, and three times more likely to say both countries would stick to their agreements. Trump’s unconventional approach toward North Korea had many skeptics ahead of the summit, though it was at least a welcome development compared to the brinkmanship of the past year. But many observers suggested Trump gave up huge concessions to Kim — namely a freeze on US-South Korean military exercises, long a sticking point for North Korea — without getting very much tangible in return. North Korea had agreed to “work toward” denuclearization, which is largely what it had said ahead of the summit. 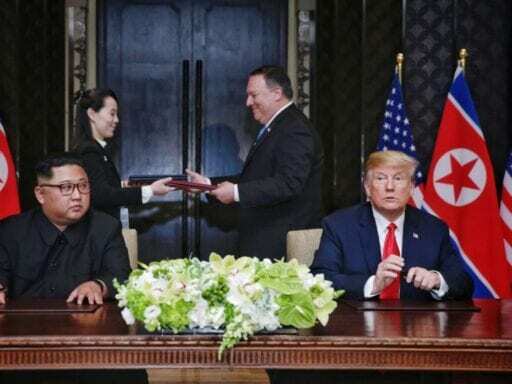 Trump’s self-congratulatory victory lap on North Korea seems to have worked with his supporters — including the congressional Republicans who nominated him for the Nobel Peace Prize, even before the actual summit.